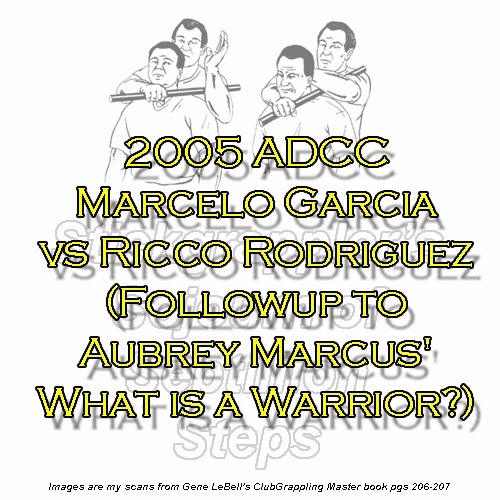 Aubrey Marcus' What is a Warrior? I loved the Warrior Poet piece you just did. I've heard and read his stuff before. It's awesome. The last line of that last poem always makes me think of ADCC 2005 Marcelo Garcia vs Ricco Rodriguez. Marcelo fought and beat his Giant. It ALWAYS inspires me. I think you should do a follow up using this fight as visualization. I thought that it was a great idea! My apologies to Derek on the delay in posting this followup! This post dedicated to all the Warriors who have slayed their Giants as well as future Warriors who will slay their Giants; to Aubrey Marcus; to Marcelo Garcia and last but definitely not least, to my friend Derek! Enjoy this David vs Goliath fight where Marcelo Garcia slays his Giant to show the Warrior that he is! Have you slain any Giants lately? What are you waiting for?!?! Bruce Lee's The Way of the Dragon remake! Happy 40th Birthday Grace Park!! Happy 90th Birthday Taky Kimura sifu!! Happy 47th Birthday Renzo Gracie!! Happy 74th Birthday Chuck Norris!! Joe Lewis would've been 70 today! Happy 54th Birthday Freddie Roach!! !